So, last week I ended up getting rid of my Akai MIDIMix, which I have used as my main MIDI controller in several performances here in Algarve! As I likely mentioned in some of my posts regarding those performances, I was pretty happy with it as I always felt it is a pretty sturdy controller! And if you want a mixing controller for Ableton Live, I still think this is a really good solution! It is pretty compact, while still giving you control of up to 8 channels at the same time! The only weird thing is that, unlike what happens with the Ableton Push or with the Akai APC40 and APC Keys 25 that I had, you have access to 8 channels at once, but you can only access to specific sets of 8 channels (1/8, 9/16, etc..) rather than scrolling channel by channel. Fortunately this isn't an actual problem, but might seem weird to you if you are used to other Ableton controllers, as I was. However, not all is perfect with it, and if what you want to do is control synths or other MIDI devices rather than Ableton, you'll likely notice quickly it falls short from being a truly amazing controller, despite it could definitely be one! With Ableton, you can control more than 8 channels, thanks to the Bank Left and Bank Right buttons. However, when used as a MIDI controller, those buttons have no function, and you are limited to 8 columns of 3 knobs and 1 slider, plus 2 buttons and the Master slider. The only button in the last column you can use, when using the Akai MIDIMix as a MIDI controller, is the Solo button, which actually enables you to give two different assigns to the Mute button. Saying this, I still feel it is a pretty nice controller, that is very easy to configure and the knobs / sliders all have a very solid feeling that make it a joy to use! The feeling you get might be different, since you are using a touchscreen rather physical controls, but that also means you are able to use X-Y pads to control certain parameters of your synths, which can result in very interesting manipulations of your synth sounds! And of course, you can control many more parameters with Lemur, even if you have to split them in several pages! And if that wasn't good enough, you can also feature buttons that remain active after you depress them in your interface (and even buttons that give you menus, so that you can, for instance, easily select the shape of your LFO). If I was using Ableton Live a lot, the decision would be much harder, but since I have barely used it (and back in the studio I have an Ableton Push...), I felt giving up on it was the right decision! 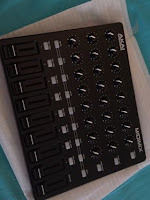 But if you are looking for a cheap mixer controller for Ableton Live, I can definitely tell you that the Akai MIDIMix is a nice choice for that task!